We booked this cruise with less than 4 weeks before the sail date. 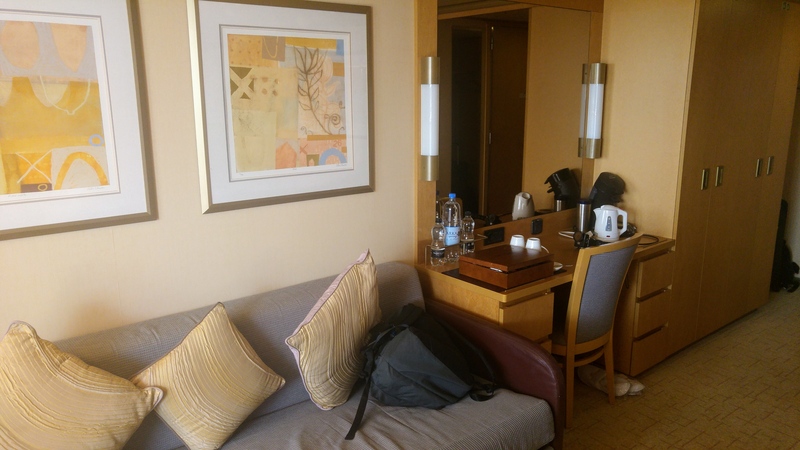 We normally book a balcony but the difference between a balcony in our usual class and a mini-suite was minimal plus we got extra onboard credit. 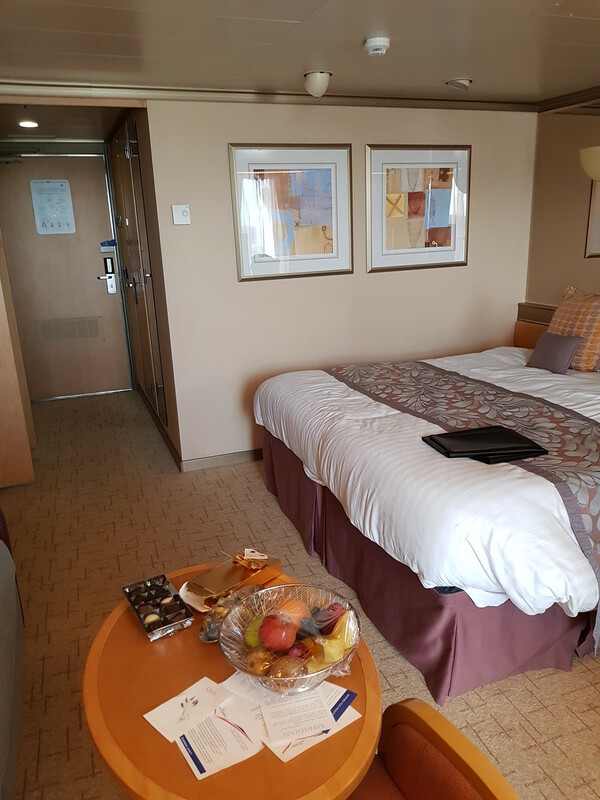 We took a risk and went for a guaranteed mini-suite and with two weeks to go we were assigned a cabin on the right deck and just along from the aft staircase – result! Next we headed up the buffet so Chris could eat some lunch and just after 1pm there was a general announcement that our cabins were ready. 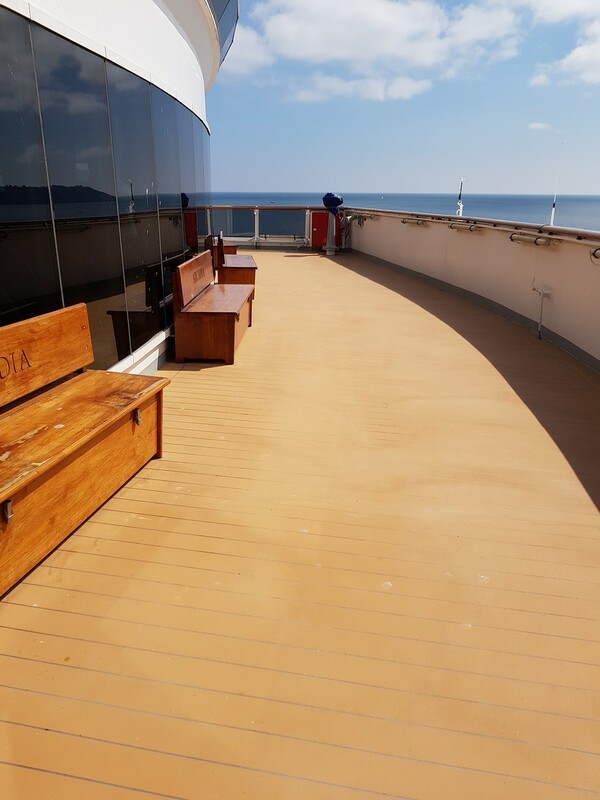 So we headed down to deck 7 (or Bermuda deck), opened the door to our cabin and couldn’t believe our eyes. It was so huge! 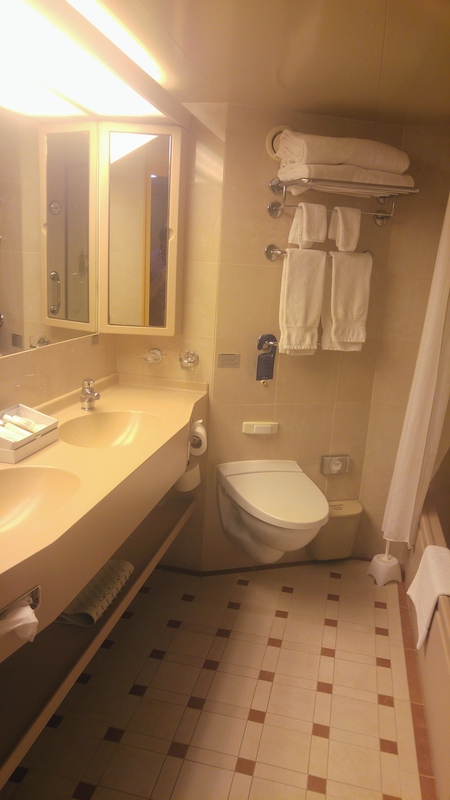 A large lounge area with a long sofa bed, a long and deep balcony overlooked by a window and double-doors, dual basins in the bathroom, a whirlpool bath and a separate shower unit. Also provided in the cabin was an atlas, binoculars, bathrobes, slippers, magazines, coffee machine and DVD player. We also received chocolates, a bowl of fruit and over the two nights, two plates of canapes. One could get used to this! 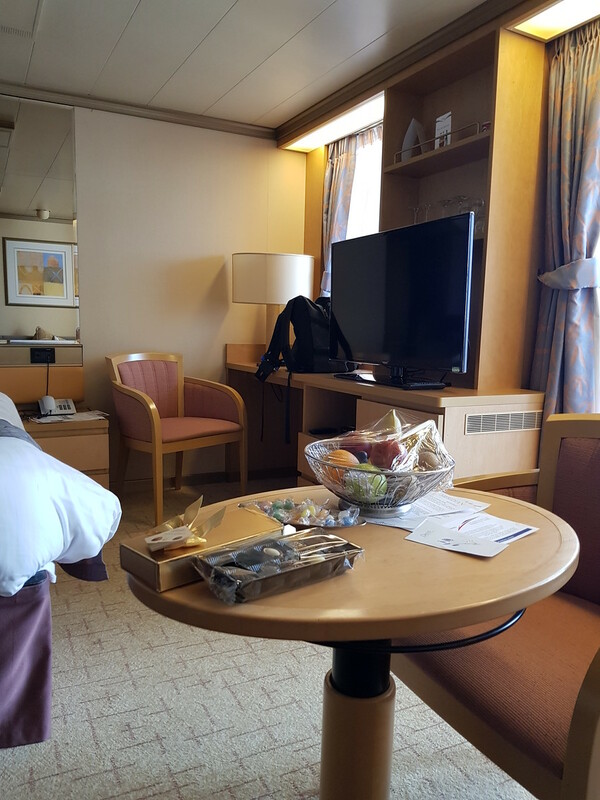 We loved this cabin and were dismayed that mini-suites are only available on a limited number of P&O ships and you would have to look for more bargain prices closer to the sail date….in the meantime, it’s back to normal balconies (sigh). 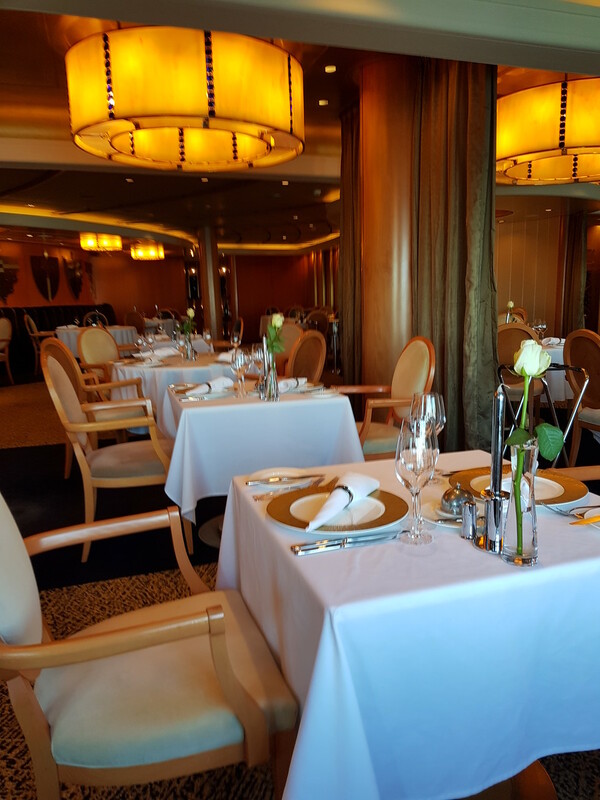 Ocean Grill is a speciality restaurant based on dishes by the celebrity chef Marco Pierre White on deck 2 midship. 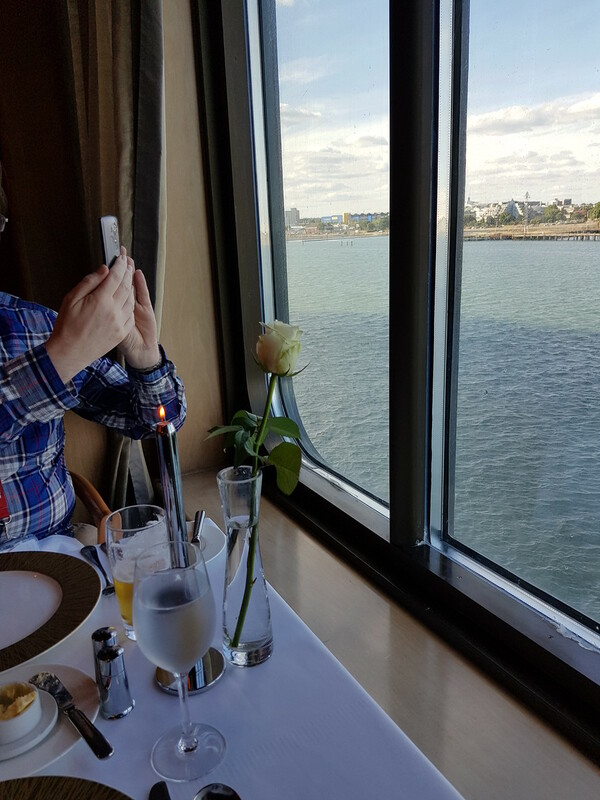 There is an additional charge of £22.50 per person which we pre-paid when I booked a slot in advance via the P&O Cruises website. We were the first customers that night and it never got that busy – it probably would be busier on longer cruises. The restaurant had a nice ambience and we were happy to be seated by the window. 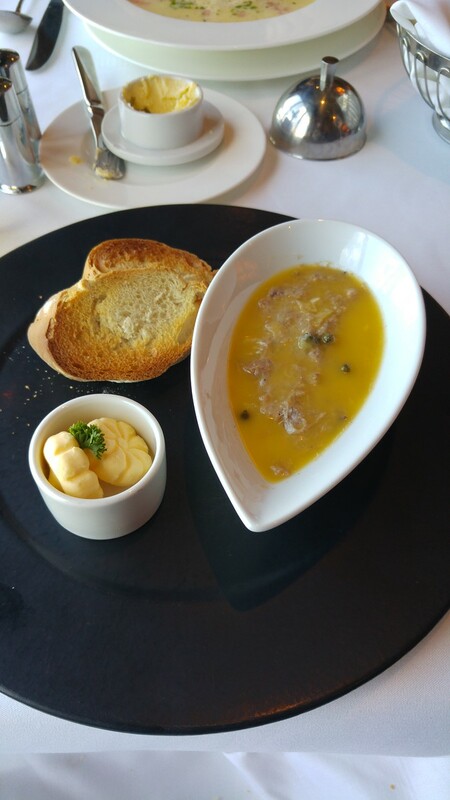 After looking through the menu – which was option 1 of the 2 menus published on the P&O Cruises website – Chris selected the Potted Duck Rillette as a starter and I went for the Thai Fishcake. While were waiting, a waitress bought us each a little cup of fish soup (didn’t catch the proper name) that was compliments of the chef. 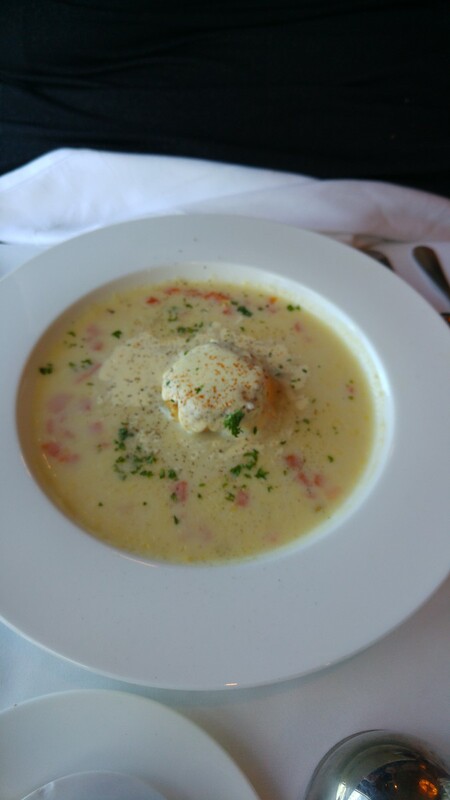 It was thick and creamy but I found I had to eat a bread roll with butter with it to help it go down! 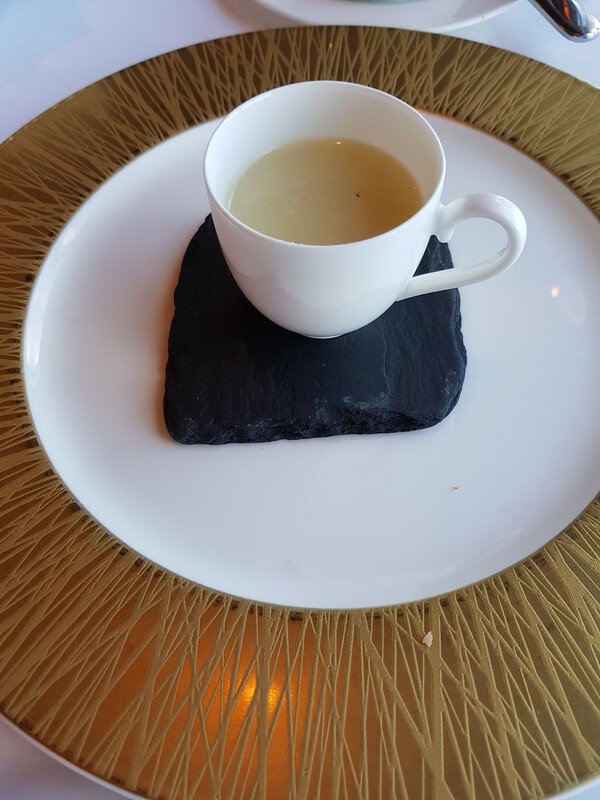 I much preferred the chowder that came with my Thai Fishcake starter. Chris’ Potted Duck Rillette had some big pieces of duck in it but he wasn’t a fan of the potted part. The toasted sourdough went down a treat however. 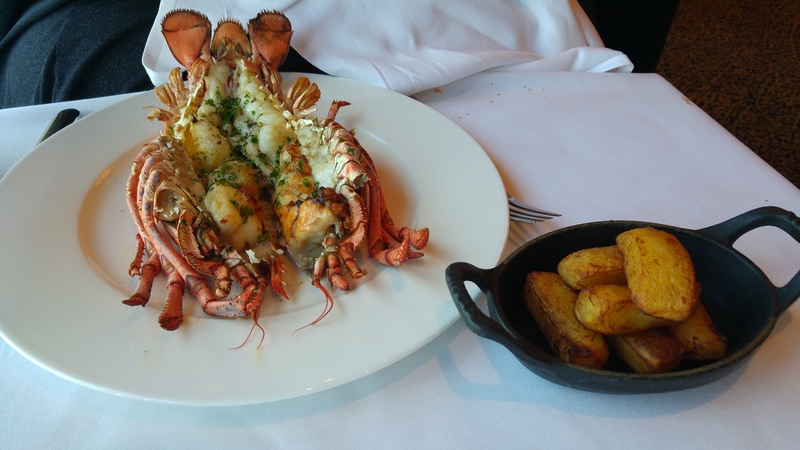 For our main dishes, I went for the Whole Lobster (at an additional charge of £3.50) and Chris chose Fillet Steak. Both came with Triple Cooked Hand Cut Chips and sauces. 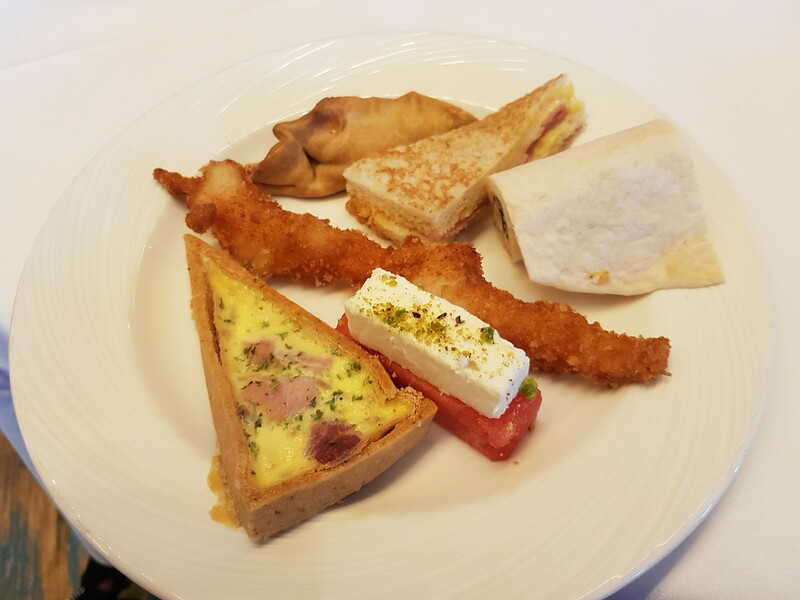 These dishes were amazing! So worth the upcharge. 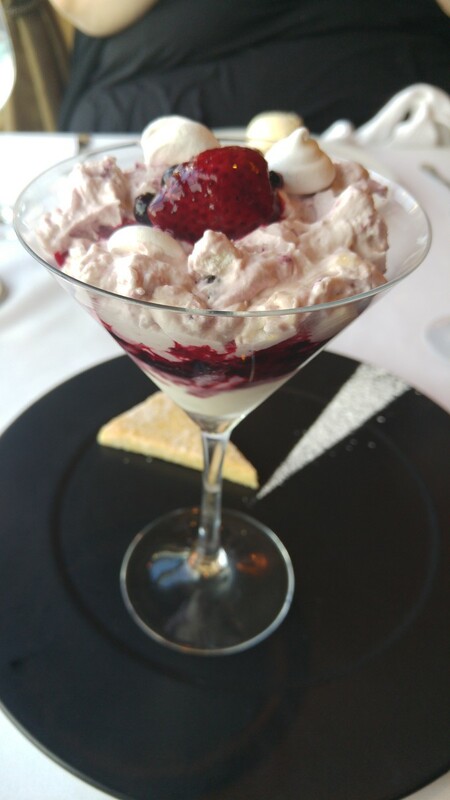 We barely had room for dessert but we went for it – I selected the Apple Tart Tatin and Chris chose the Eton Mess. 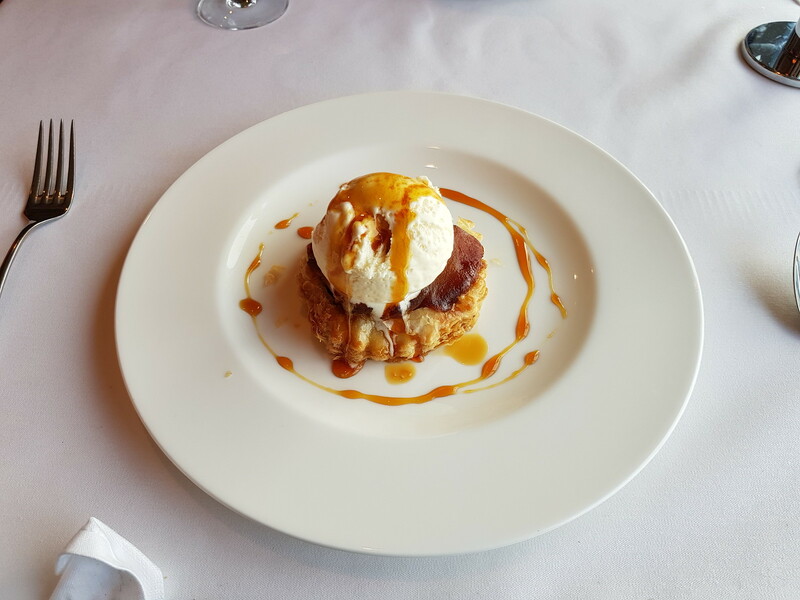 We shared both and enjoyed the Eton Mess immensely but found the Tarte Tatin rather too burnt for our tastes – the ice cream was glorious though. 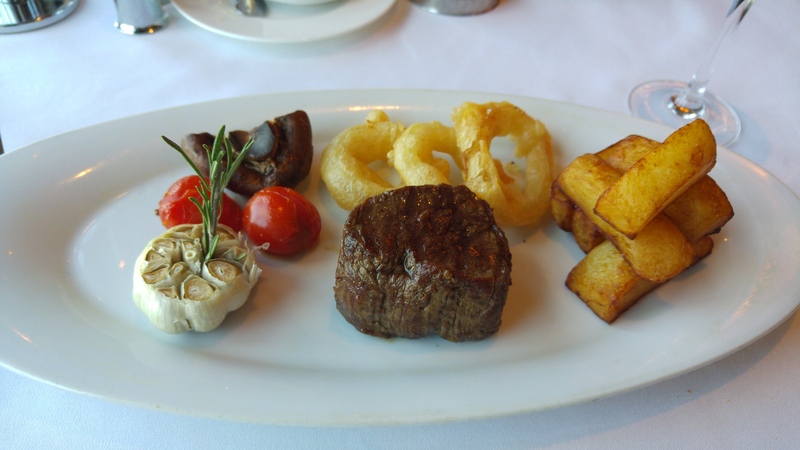 We would gladly go back to this restaurant to try other dishes from the menu or even just for the steak! 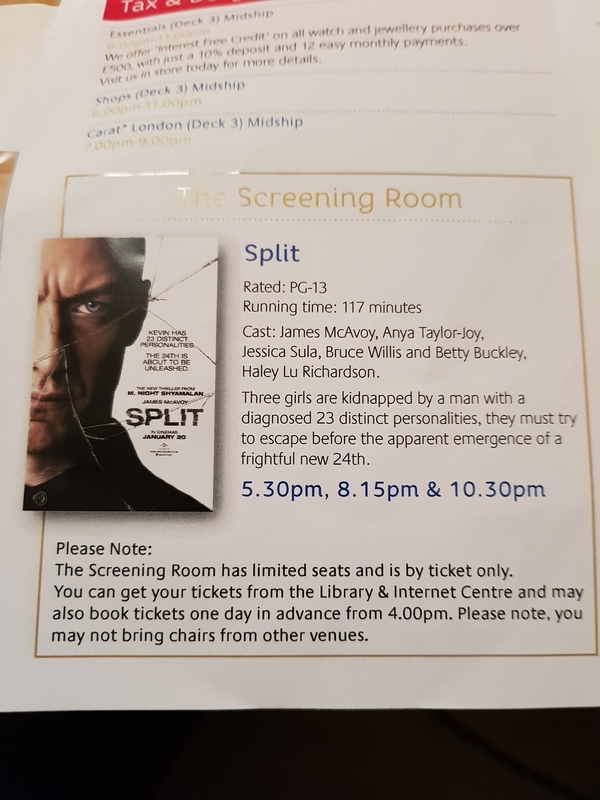 We don’t usually go to theatres on ships because they are not very comfortable, it’s not easy to get drinks and the shows are usually not to our taste. 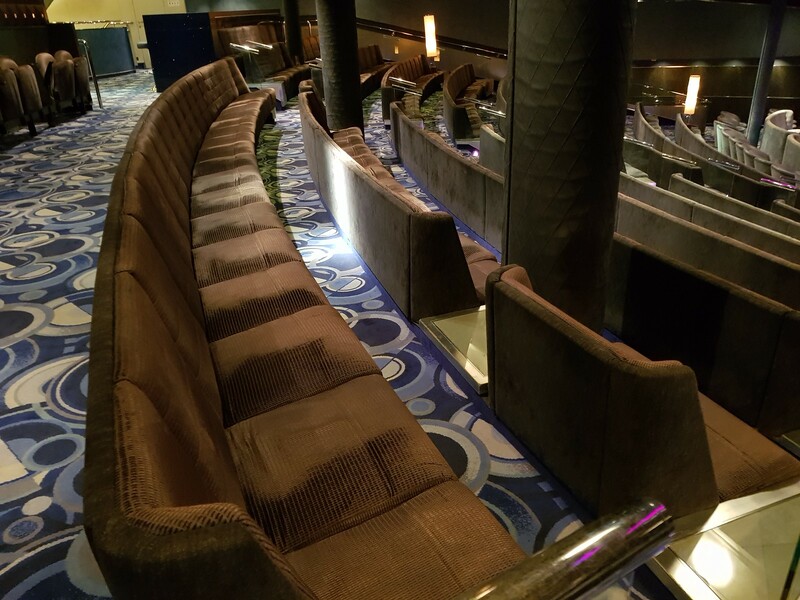 But the theatre on P&O Arcadia is amazing – open banquette seating with tables on the lower tiers for your drinks. 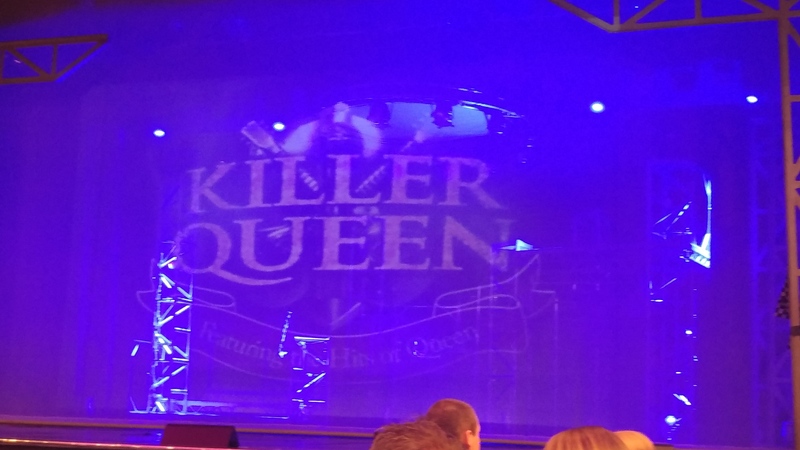 We even went to a show put on by the Headliners Theatre Company – Killer Queen – and joined in when they got the audience waving and swaying to ‘We are the Champions’. You can’t top the Queen repertoire and they had some great singers in the cast. The Palladium Theater has seats on 2 levels – decks 2 and 3 Forward and puts on 2 shows each night to coincide with the traditional dining times. We sat in what might be called the “stalls” and got there at least 20 minutes before showtime. This also allowed us to order our drinks in good time before the show started. We are movie geeks and try to watch as many as we can (even staying up to watch the Oscar ceremony every year – 5am finish anyone?) so The Screening Room is right up our alley. 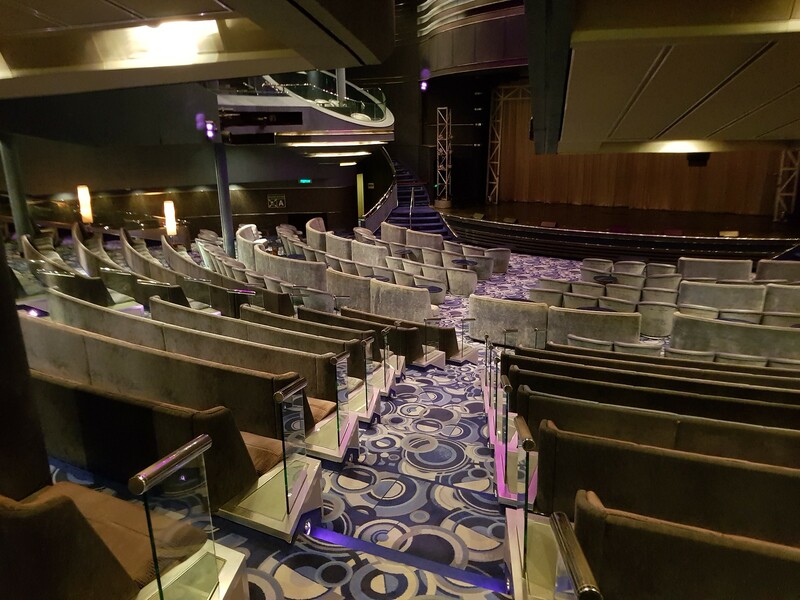 This is a small cinema on deck 3 forward containing 30 plush leather comfy seats with built in drink holders – there is even a little cafe foyer outside. The films are advertised in the daily Horizon newspaper – we had 3 showings on the first night and 6 showings from 10:00am to 10:30pm on the port day. Because of the limited number of seats you need to get your tickets in advance from the Library and Internet Centre which is just around the corner (but check the opening times). 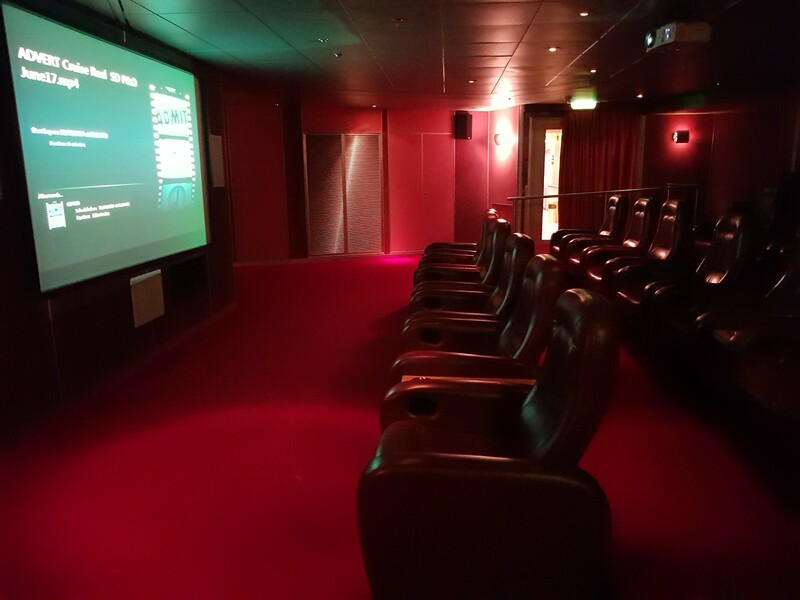 The movies shown on our cruise were from the last two years and were not exactly blockbusters but it’s a nice intimate setting. While in port in Guernsey we went on an adventure to find “the secret deck” . 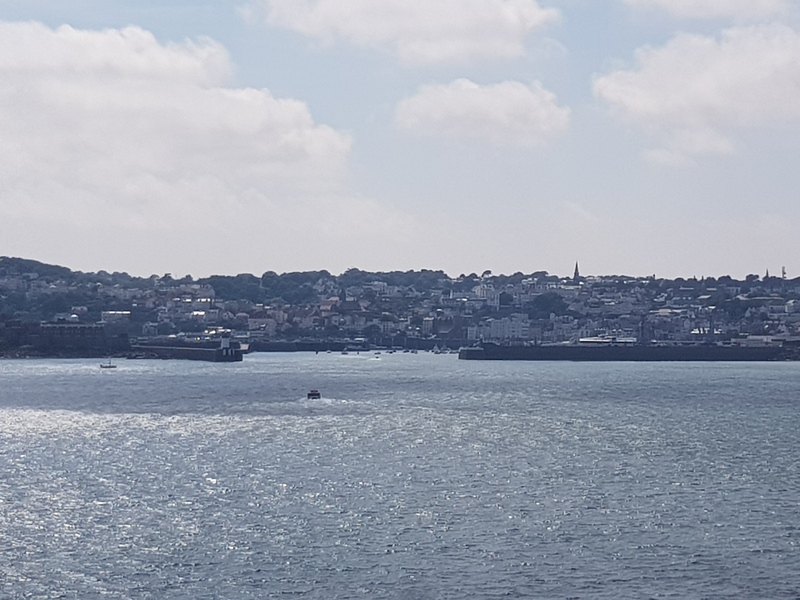 This is at the front of the ship and Chris wanted a clear view of St Peter Port from the deck. I had seen a reference before to this deck and knew it was (shhhh) “somewhere near the gym on deck 9”. Oh my gosh, it was gorgeous, completely empty – but very windy on that day! This was the view we got of St Peter Port in the afternoon sun. There were lots of other things we liked about P&O Arcadia – the view from the Crows Nest bar, the scenic lifts that look out at sea on both sides of the ship, the hot dogs from the Neptune Grill, the curries and breakfast options in the buffet, afternoon tea in the dining room, the live music and karaoke in the Globe and Rising Sun and, of course, the cocktails! Plus we loved the fact we could get to places more quickly on a medium-sized ship. 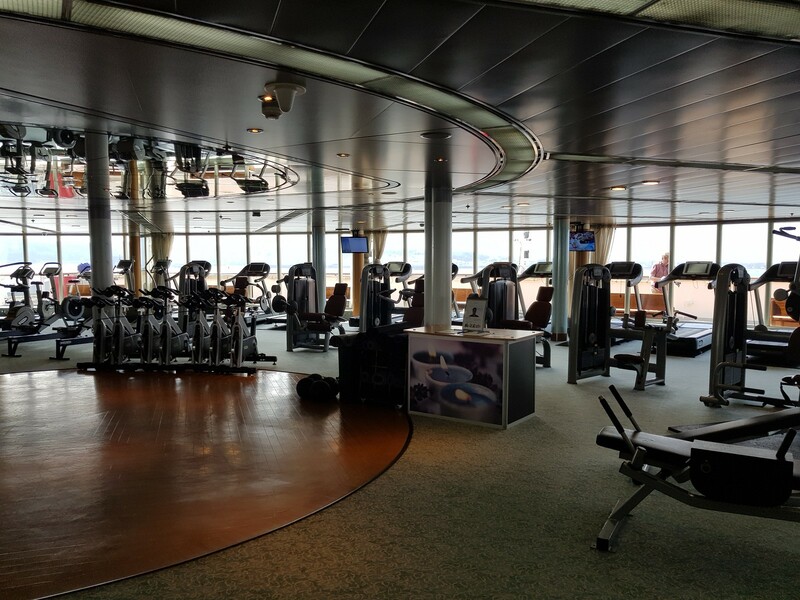 We look forward to cruising on Arcadia again. 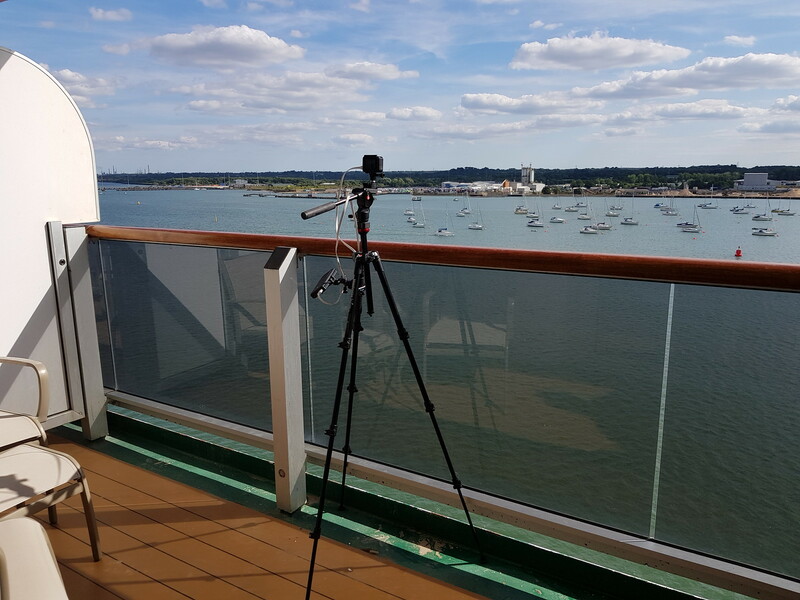 Next Next post: P&O Azura Cruise Review – it was worth the wake!